I don’t think there is anything more luxurious or just plain fun as staying in your own Langkawi private pool villa. It’s so nice to be able to step just outside your room for your own fun or romantic times in your own Langkawi private pool! Whether you are on a honeymoon and want privacy or a family and want things easy, it’s hard to beat a private pool villa anywhere but I think they are extra special here in Langkawi where the weather is made for pools and there’s such great scenery! Below, we have compiled a list of all the Langkawi hotels with private pool so private pool hunters like you can find the best option! We compare the different resorts and then have full reviews for each along with a map at the end so you can compare locations. The good news is that they are all fabulous options and you can’t go wrong! Struggling to decide on the best hotel in Langkawi with private pool? Here’s all the options side by side! Note that all of the hotels in Langkawi with private pool are 5-star except for La Villa Langkawi so they all cost more than the average Malaysian hotel. The price ratings above are for comparison purposes only. This private pool suite could be all yours right by the beach! The Andaman Langkawi is a personal favourite of ours as we had so much fun when we stayed here with our kids. It has a good balance of being a big resort with many facilities while having plenty of space so you still feel very away from it all. Along with the Four Seasons, it’s the best options on this list of hotels in Langkawi with private pool for families with a fabulous kids club known as the Young Explorers Club. However, whether you are a family or not, you will absolutely love the Executive Pool Suites. These suites are just beautiful and big – they are more like large one bedroom apartments. They consist of a big bedroom area with king-sized bed, a huge bathroom with an awesome bath and a big living area where you can make up a sofa bed if you are travelling with kids. This is what we did and it suited our family of four beautifully. The star attaction, however, is definitely the fabulous terrace area complete with private pool. You can see part of ours pictured above. The pool is a decent size for a private pool, being like a small lap pool. There is also enough space on the terrace to relax and enjoy the surroundings. We were also lucky enough to have direct beach access from our terrace. Most of these suites have trees outside instead but are just seconds walk from the beach. You can see inside an executive pool suite in the following video. There are many other room types as well as a suite with a private jacuzzi. The Andaman is a luxury resort so if you can pull yourself away from your room with private pool in Langkawi, you will find top rate facilities. The private beach, for a start, is beautiful. The resort is basically between the beach and rainforest and it makes for a really stunning location. This is a secluded part of Langkawi so this resort is for people who want to get away from it all. There is a huge communal pool to splash around in and relax by if you tire of your own or the beach and you can go on guided walks in the rainforest. You can learn about coral in the coral nursery and snorkel. There is a daily activity schedule not just for kids in the kids club but also for adults. The seclusion of the resort means you will probably eat here a lot of the time so luckily there are some great options with four restaurants and several bars/lounges serving a variety of cuisines. We particularly enjoyed the seafood. The gorgeous location, excellent standard of facilities and rooms, great private pools and the kids club. This resort is somewhat isolated so it’s for people who mostly want to hang out at a resort. The Andaman is perfect for anyone looking for secluded, beachfront luxury where you can stay in top class Langkawi accommodation with private pool. 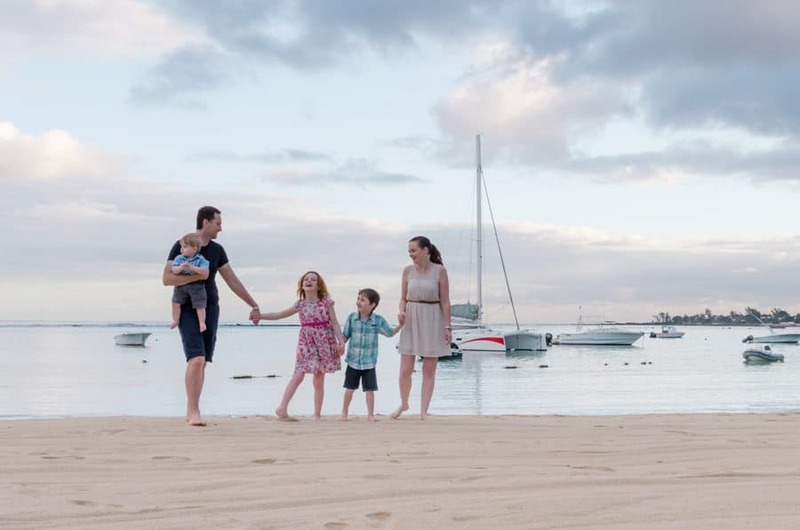 This is one of our favourite resorts anywhere and we particularly recommend it for families. Another luxury choice for a hotel in Langkawi with private pool is right next door to the Andaman at the Datai. This is also for people who want secluded luxury surrounded by nature with this resort well positioned in the rainforest and by the same private beach as the Andaman. 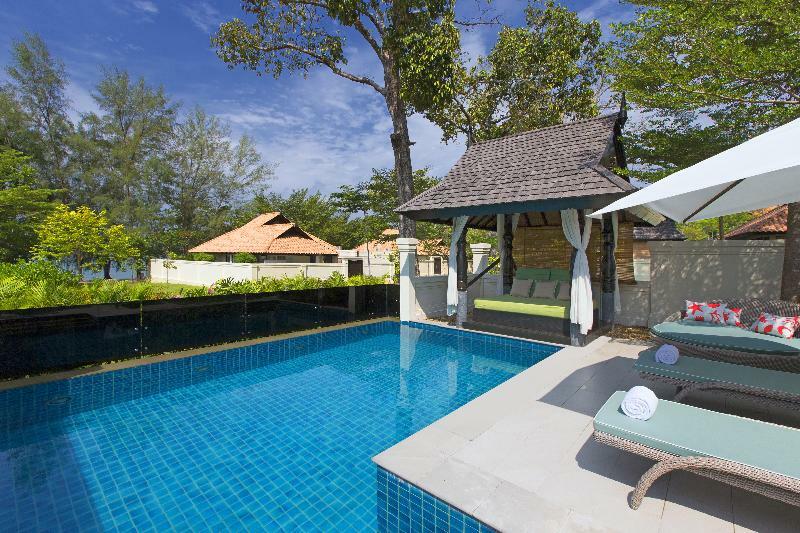 It also has what is perhaps the best private pool villas in Langkawi. You will feel like you have escaped the world here! This Langkawi resort with private pool options has a variety of room types. The best ones with private pool are the one and two bedroom beach villas and the rainforest pool villa. The difference between a rainforest and beach villa is whether you want to be surrounded by rainforest or have a beach view – I promise you will love both opptions! Either way, you will have a spacious, beautiful villa with a great outdoor area complete with a big ten-metre pool. If you can force yourself to leave your villa, there are also many facilities here. You can enjoy the beach, one of the three pools (for adults, families and toddlers), health club, water sports and there are also many nature activities for all ages. The resort also has four restaurants and two shops and the good news is that rates include breakfast, afternoon tea, minibar and airport transfers. A huge plus for this resort is that it only recently re-opened after a complete refurbishment. This means the whole resort is just sparkling right now! It’s the perfect time to go. The beautiful location, the private and secluded villas, the great sized pools. Pure luxury! It is removed from the main parts of Langkawi, kids are only welcome if they are quiet (even in the family pool!) and it is expensive (but you get what you pay for). If you want the absolute top choice of resorts in Langkawi with private pool then this is it! You will really feel like you have escaped it all with fabulous, private pool villas in a stunning location. We especially recommend it for a romantic break. Another 5-star option for a Langkawi hotel with private pool is The Westin Langkawi. This choice is particularly good if you want a spacious villa with a great pool in a more convenient location. The Westin has its own private (and nice) beach like the options above but it’s also just minutes drive away from Kuah which is the major town on the island and where the main jetty is located. This means it is much easier to get out and see things and eat and shop somewhere other than the resort if you wish. This hotel with private pool in Langkawi has many room types but the ones you should consider are the villas that range from one to five bedrooms that come with their own private pool. We particularly love the one bedroom beachfront pool villas. All villas are well presented and have living spaces, spacious bathrooms and bedrooms. They also have beautiful outdoor areas with their pools. For the ultimate in luxury when travelling with family or a group, try the five bedroom villa. It’s huge with gorgeous views. Take a quick look at a one bedroom villa below. In 17 seconds, it’ll convince you that you want to stay here! When you pull yourself out of the pool, there are many facilities at the Westin including the 500 metre private beach, four pools, gym and spa. For families, there is a kids club. There are also many watersports, squash and tennis courts and, of course, multiple restaurants and bars. The convenient location, the lovely villas and the fact that they range from one to five bedrooms. The location is not as beautiful as others on this list. This best resort in Langkawi with private pool is perfect if you are looking for your own villa with private swimming pool for lots of fun while having all the facilities of a 5-star hotel and a private beach. You also have the added benefit of being just a short drive from a town with many eating and shoppingoptions. Another 5-start option for a Langkawi villa resort with private pool is the Four Seasons Langkawi. This resort is tucked away in a UNESCO World Geopark, suirrounded by jungle and with a private 1.8 kilometre beach stretching along the Andaman Coast. If you want beauty, you definitely have that here! The Four Seasons is a quiet, family-oriented retreat and we particularly recommend this resort for families. While being out of the way, the Four Seasons is still just 20 kilometres from the Langkawi International Airport. There are a variety of room types but the ones you should look at for a private pool are the villas. All the villas have at least a plunge pool with the three bedroom family villas and the royal beach villa having bigger options. You can chose villas accommodating from three to eight people so these can be a great options for groups or large families. Any option is private, stunning, spacious and with indoor and outdoor areas. There is a choice of garden or sea view and some have direct beach access. You can see inside one of the villas here – you will be impressed! There are many facilities and activities at the Four Seasons particularly in the surrounding nature. You can snorkel, birdwatch, go on mangrove safaris or island hopping. Of course, you can also relax on the private beach or take a walk through the surrounding rainforest. There are also the usual resort facilities with a gorgeous pool, gym and day spa. There is a superb kids club with a daily program for children aged 4 to 12. This includes activities like batik painting, safari cruises, treasure hunts and kids’ yoga. For teenagers there are special activities too like archery, rock climbing and henna tattoo design. For family time, you could attend a cooking class, go kayaking or kite-flying on the beach. There are a lot of options at this resort. There are multiple eating and drinking options and you will be well taken care of. The Four Seasons has stunning pool villas in a stunning location with many activities on offer. It is a very large resort so it takes time to walk from one side to the other. However, there is a buggy service to help get you out. It is secluded so you need to be happy eating most meals here. The Four Seasons Langkawi is in a stunning location while still being accessible to attractions in Langkawi. There are ton of activities on offer for adults and kids and the pool villas are gorgeous and in a range of sizes. La Villa Langkawi is perfect for private pool seekers looking for a location closer to the heart of the action in Langkawi who don’t need 5-star resort facilities. Just a few minutes drive from the main beach at Pantai Cenang, there are a lot of eating, shopping and activity options around here – although note that you don’t have a beach by the resort itself. This accommodation differs from the others on the list as it doesn’t have a ton of facilities – it’s really just about the villas although you can have a massage in your room or a tour arranged. The La Villa Langkawi private pool options are great. You have a choice from one bedroom villas either with a regular (but fine) pool or a deluxe private pool. All villas are well presented and have living areas, full kicthens with stove tops, microwaves and kettles. The bedrooms have a king-sized bed. The convenient location near Pantai Cenang and beautiful villas. Not by a beach and no resort facilities. This is the only private pool option close to the action at Pantai Cenang. The villas are beautiful and its perfect for anyone who would rather be near the action than having a beach and resort facilities. The St Regis Langkawi is another 5-star private pool option just a short drive from Kuah town but still in a luxurious location with a private beach. 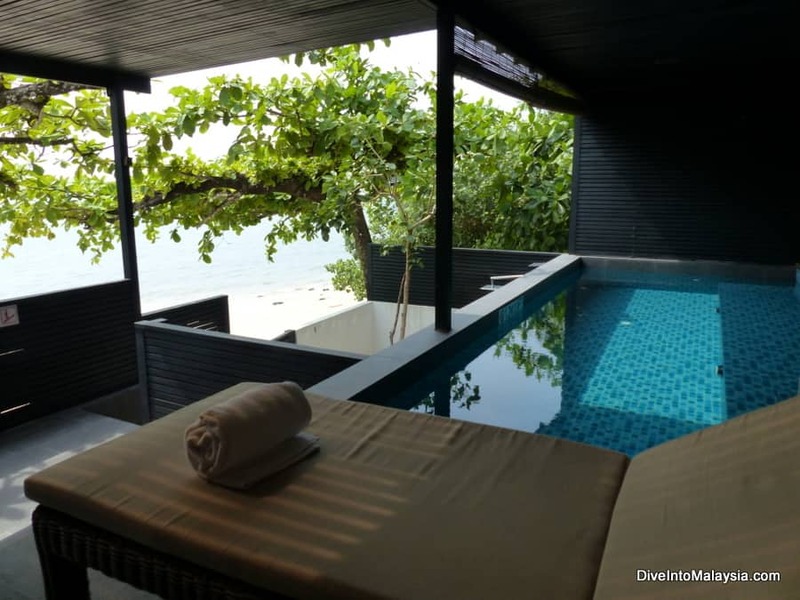 Lying in the resort infinity pool, you have great views over the beach and Andaman Sea. This resort has some nice facilities and you can enjoy the day spa, gym or set out to see the island from the tour desk. For dining, there are multiple restaurants, a cafe, bars and, of course, the option to take the short drive to Kuah for many more choices. There are also private dining options which are particularly romantic. There are a range of room types – as a private pool seeker, you definitely want to look into the one-bedroom pool suites and sunset villas which all come with plunge pools. For more luxury (or for bigger groups) there is also a spectacular 4-bedroom, Sunset Royal Villa with pool. The convenient location and the lovely, spacious villas. There are not as many facilities as most options here. This is a great option if you want to be near Kuah and stay at a quality 5-star brand. If you are looking for more private pool options in Malaysia, click here to read our list of all private pool hotels in this great country!